Stained Glass windows, using the copper foil method, ranging in shape and size from 12 inch circles to free standing pieces over six feet tall. A stained glass mosaic technique,all hand cut, grouted in ,trimmed in copper. Some incorporated into wood frames,with occasional metal and or stone accents. I create planters, patio chandeliers, wind spinners & sun catchers. I use the traditional "Tiffany" or copper foil method where each piece of glass is hand cut, ground to fit, foiled & lead soldered. Jewelry is handmade using expert, Old-World techniques featuring gold, silver, gemstones, & conflict-free diamonds. I use hand-fabrication and lost-wax techniques to create my distinctive jewelry. I bead embroidery,knot,wire and weave using seedbeads, semiprecious stones, pearls, silver,crystals and fibers..
Oxidized & texturized silver metal and hand coiled wire. Some designs incorporate antique buttons. I knot,crochet,wrap, and sew my designs.All are done by me by hand (for 40 years now) with silk/nylon blend cord,repurposed stones,silver,wood,gold,crystal etc. Demonstrating Artist for 25 years. 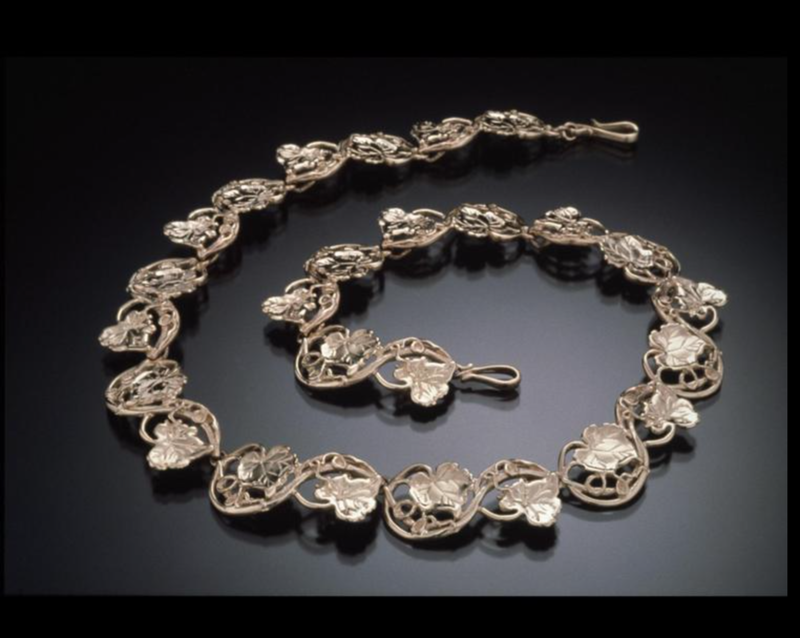 Fabricated jewelry of Sterling, reticulated silver and 18k gold set with unique gen stones and pearls and/or champleve enamel work. I use all organic materials: bone, horn, fossil ivory; 14k gold & sterling silver. I hand fabricate all metal work...no casting, no production. I have developed my techniques specifically for these materials. Sterling silver 14k 18k 22k gold jewelry crafted with cast Cottonwood twigs, Bristlecone Pine textures, forged & roller-printed. Accented with gemstones and freshwater pearls. I use a combination of silver and gold using sawing,soldering,and hammering techniques. Additionally,I hand-carve designs into silver. Making a truly unique one-of-a-kind of wearable art. 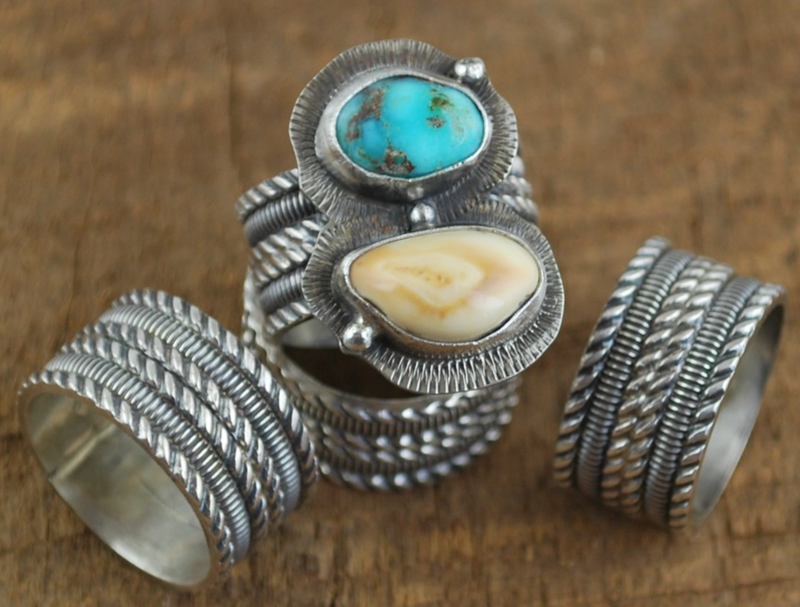 Copper and fine silver PMC works are shaped by metal smithing techniques, torch flame painted, enameled and embellished with natural gemstones and sterling findings. A single thread of precious metal wire is wrapped tautly and precisely on a frame structure or "loom." 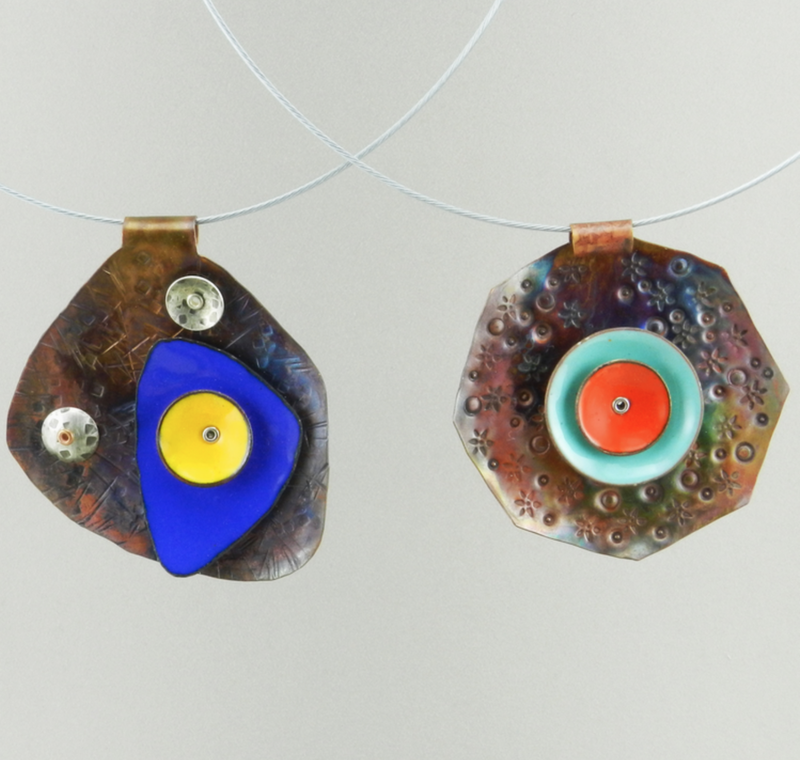 Some pieces have kinetic elements of stones housed in or riding on the crossing wires.